The Honor View 10 is the latest powerhouse flagship from Honor competing in the mid-range marketplace, it comes packed with top of the line features as a flagship should, but, is it enough to compete against its sister company Huawei’s Mate 10 Pro? Well, let’s found out. Many devices targeted to the mid-range market have been known to be “Flagship Killers” because they offer bleeding edge specs that directly compete against high-end handsets, and costs significantly less. In the case of the Honor View 10 and the Huawei Mate 10 Pro, they are powered by the same Kirin 970 processor and the same Neural Processing which allows for optimal artificial intelligence processing, this pretty much makes them equals on the inside. When it comes to RAM and STORAGE, things are the same, since both of them have 128 GB internal memory storage and 6 GB RAM, however, the Mate 10 Pro lacks expandable microSD slot, while the Honor View can be expanded up to 256 GB. Both versions have decided to remain using the now-obsolete Bluetooth 4.2 instead of the Bluetooth 5.0, so they are both losers unless you consider that the Honor View 10 comes with a headphone jack while the Mate 10 Pro relies entirely on its Bluetooth technology for its accessories. Looking back at 2017 was marked as the year were bezel-less design was born and the trend will endure for a very long time, much like the Top Notch trend set by Apple’s iPhone X, and both the Honor View 10 and the Mate 10 Pro are thankfully up to date with this trend, and honestly, they look awesome. Both devices feature a fingerprint scanner, but while the Honor View 10 has his embedded in the Home Button, the Mate 10 Pro has his on the back of the Phone, near the camera. The display again, tells the same story for both Phones, as they are 6 inches screens, with an aspect ratio of 18:9 and a pixel resolution of 2160 x 1080. Both screens have sharp bright colors. 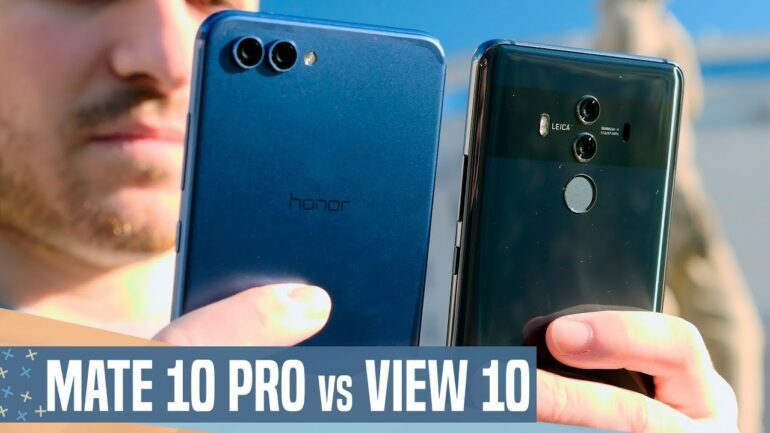 The Mate 10 Pro comes on top, however, as it features an AMOLED HDR display, while the Honor View 10 falls short with its IPS LCD.